This blog post was written by Jake Ten Haken. 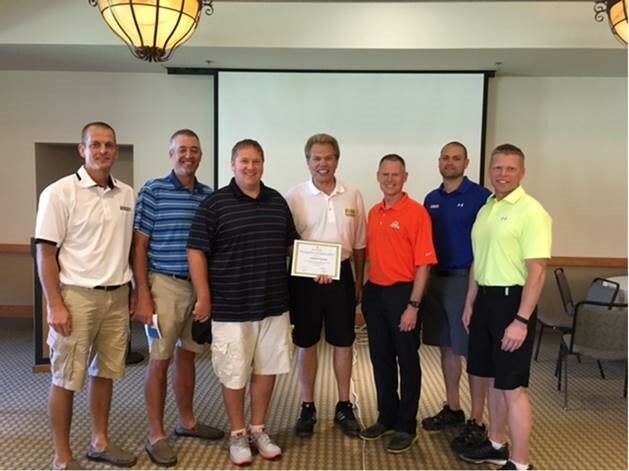 In June, a few Interstates employees participated in the Ardent Mills Annual Golf Charity Event, which has been benefiting the Food Bank of the Rockies for the past two years. A donation of $500 was made to the food bank in Interstates’ name in honor of a service award the team received. In all, over $126,000 was raised in the event. That’s enough money to fund over half a million meals! Of the more than 50 vendors in attendance Interstates was one of six that were recognized for outstanding service to Ardent Mills in the past year. Nominated by the Ardent Mills Engineering Team, Interstates received recognition for a line shaft motor replacement project in Wichita as well as an unplanned server rebuild for the Denver location. Control Systems Team Lead Bryan Monroe was individually called out by the Engineering team for his great support of their mills. Additional thanks went to others involved in Ardent work including the two aforementioned projects. Team members involved in those projects include Jason Wyenberg, Andrew Ter Haar, Scott Koll, Charlie Baumgartner, and a large group of others onsite and support staff. Special thanks also went out to Nathan Bullock and David Smit for their quick response on the Denver server project. Please join us in congratulating the team!